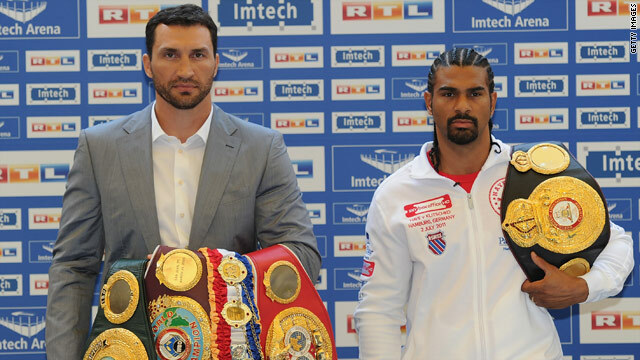 Wladimir Klitschko and David Haye will go head to head in their world heavyweight showdown in Hamburg on July 2. (CNN) -- Wladimir Klitschko has told reporters that he is finally looking forward to silencing David Haye, when the two face each other for their eagerly-awaited heavyweight showdown in Hamburg on July 2. The pair gave their first press conference on Monday ahead of the fight, and 35-year-old Klitschko made it clear that he has had enough of the insults thrown at him by his British opponent. Klitschko, who holds the International Boxing Federation (IBF) and World Boxing Organization (WBO) versions of the belt, said: "All this hype and interest is great for the division. "But there will come a time when the talking stops and we find out who is the real champion," added the Ukrainian, who has now recovered from an abdominal injury that has troubled him recently. "The man has been promoting himself and insulting the Klitschko brothers in a disrespectful way -- but this fight is exciting for the division and I am thrilled it will happen. "I still have to give a lot of respect to David Haye, he is a really exciting fighter, he is a really good puncher, he's very quick. "It's not going to be an easy job for me, but I know what to expect and I know what to do. "They will be 12 long rounds and I hope he won't give up or get knocked out. My plan is to hold him up until the final fight and then knock him out," added Klitschko. Meanwhile, Haye, who holds the World Boxing Association (WBA) version of the title, continued his onslaught on Klitschko, saying: "I believe he is a fraud, down to the fact he wears shoulder pads into the ring and he only picks the guys who he knows he can beat. "I am good at exposing frauds, as I showed in my last fight," added Haye, who beat ex-Olympic champion Audley Harrison inside three rounds last November. "I will make it a bit more exciting this time."